Who should fund Australia’s adaptation to climate change? If we haven’t heard much about carbon policy this election, we’ve heard even less about the other side of the climate equation – adaptation. We’re already seeing an increase in extreme weather, and climate models predict we’ll see more in the future, costing us potentially billions of dollars. Adaptation attempts to answer how we will deal with the future. In light of this, the shadow minister for climate change Greg Hunt announced A$9 million for the National Climate Change Adaptation Research Facility in Queensland, or NCCARF. Within limits, the impacts of gradual climate change should be manageable. Therefore, climate change adaptation can be understood as: (a) adapting to gradual changes in average temperature, sea level and precipitation. Gradual climate change allows for a gradual shift in the mix of crops and to alternative farming systems. 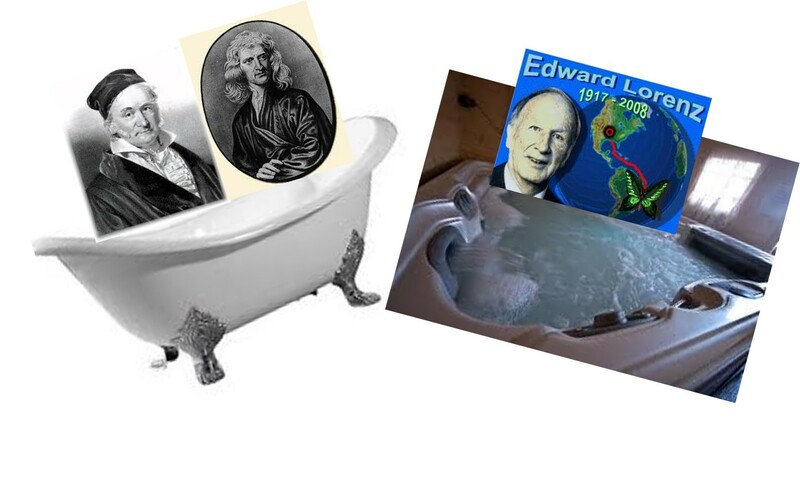 So why are Gauss and Newton in the bath and Ed Lorenz in the hot tub? Whatever we do for our ecosystems we know that climate change means a fundamental shift in what our ecosystems look like. Arguably it is where aggressive mitigation might be the best adaptation option. In the absence of this, what do we do? If we keep doing what we do now (build resilience, biosecurity, reduce fragmentation) is it enough? Should we be pragmatic and start preparing for trade-offs – determine sacrificial species or ecosystems that we can’t save? Is it simply an economic exercise of optimising our investment to get the best diversity bang for our buck? Or are we simply on the slippery-slope to slime with weeds and algae the future of biodiversity. The NCCARF (National Climate Change Adaptation Research Facility) Climate Adaptation Conference climate adaptation knowledge + partnerships is on from June 25-27 in Sydney. I’m attending to present the results of our recently completed project Valuing Adaptation under Rapid Change. There are many researchers and practitioners of climate adaptation from Australia and overseas here, but there is also a sense of things winding down, because NCCARF finishes up at the end of June with no obvious Commonwealth footprint in climate adaptation beyond that date. Throw in the recent efforts by some state governments to open up for business and cut green tape, there is a genuine uncertainty about the future of research that aims to improve the three pillars of sustainable development: economy, environment and society, over long time scales. Ahh yes, but I hear you say, research is like policy, it doesn’t only need to be enacted (i.e., published in the peer reviewed literature), it needs to be enabled and implemented. And that’s something that research has not always been able to do. NCCARF has managed to do some of this, but with mixed success. These are a few of the headlines from the Marine Climate Change in Australia, Impacts and Adaptation Responses 2012 Report Card (download pdf). Put together by the Marine Biodiversity and Resources Adaptation Network (NCCARF), Fisheries Research and Development Corporation, and CSIRO’s Climate Adaptation Flagship. The reporting comprehensive, covering the report card itself and six chapters on marine climate and thirteen on marine biodiversity. Alistair Hobday, summarising the report card on The Conversation. Last week at the Climate Adaptation in Action 2012 Conference my colleague Celeste Young won the poster prize with her poster Communicating Adaptation Effectively. It’s good to see a poster on communication that, well — communicates. 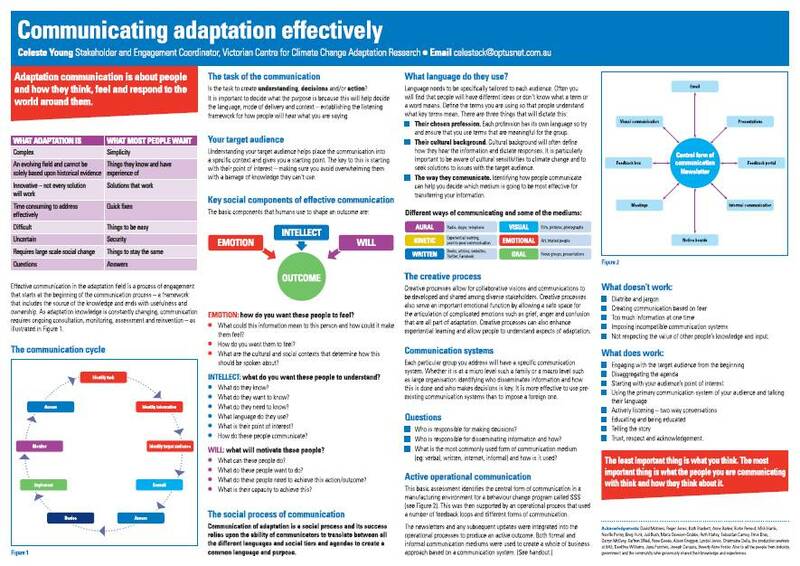 Winning poster Communicating Adaptation Effectively (C Young) Climate Adaptation in Action 2012 – NCCARF Conference, June 2012. This is a seriously good poster. It’s clear, full of useful points and provides a framework for communication. Certainly worth having as a prompt when project planning or engaging in communication activities. The poster itself and handout can be downloaded below. It can also be applied to pretty much any environmental or planning issue. Communicating Adaptation Effectively by Celeste Young is licensed under a Creative Commons Attribution-NonCommercial-ShareAlike 3.0 Unported License. Young, C. (2012) Communicating Adaptation Effectively. Proceedings Climate Adaptation in Action 2012 – NCCARF Conference, Melbourne June 26-29, 2012. Thinking about it, there were a few reasons as to why this blog went a bit quiet. A short list, then you can bother me to give further updates on some of these matters, because they are of interest. Early May was taken up with the writing and submission of the IPCC Working Group II First Order Draft. A frantic few weeks as the coauthors of the chapter Foundations of Decision-making worked hard to get a complete draft. The report is now in review and if readers are feeling a bit expertised, instructions for registering can be found here. Then straight to Den Haag, The Netherlands for a meeting on the new emission scenarios process, specifically on the shared socio-economic pathways that are being developed. These will contribute to new scenarios involving climate, social and economic change for modelling by research groups around the world. The topic was how to linked the needs of integrated assessment modelling with impacts, adaptation and vulnerability research. A summary presentation given to the UNFCCC by meeting organiser Tom Kram just afterwards can be found here (pdf). A week back to catch up with a few things, then off the Adaptation Futures conference in Tucson Arizona. Second international conference after the one on the Gold Coast two years ago. The research is slowly becoming more developed as research and implementation are becoming more closely linked. I spoke on what non-linear climate change means for adaptation and hired a road bike for the week, climbing this big mountain (except I rode from the centre of town, not the foot of the climb). Turned out it was maybe Tucson’s hottest day ever measured. Have a few pics of the Sonora Desert that I’ll upload when there’s a bit of spare time. Then back in Australia, attended a design charrette in Sea Lake, northern Victoria as we talked adaptation with the locals. A really interesting 24 hours – the locals have been really resilient over time but are still suffering loss of population due to underlying economic drivers. Capacity building in local government is a key issue. Telling stories about climate giving a “deep” history of change over time is much better to feed into discussion than presenting facts and figures (though it’s good to have them in publications to give away). Gave a talk on 19 June on the Ecology of the City, for a series of talkes hosted by Geoff Lacey at the Augustine Centre in Hawthorne on sustainability. Another “deep history” of Melbourne as a meeting place, from geology and biodiversity, to people and climate. Still back in town, wrote a context paper on adaptation and industry with Celeste Young in preparation for the Victorian Centre for Climate Change Adaptation Research annual forum Monday June 25, which was closely followed by the NCCARF national conference Climate Adaptation in Action 2012. This conference was also pretty big showcasing the work that’s going on in Australia, where research and practise are also coming closer together, though there’s a way to go. At both events we showed that it’s possible to have fun and engage serious topics, with a hypothetical orgnaised by the Environmental Defenders Office and hosted by Rob Gell on the Monday (I was a green developer in 2032) and an intelligent squared debate on Wednesday set up by Kate Auty, Commissioner of Sustainability for Victoria. The latter on science policy got into a number of issues that are exercising state of the art research, but in an entertaining manner. Down with boring panels, I say. Next week is the 41st Australian Conference of Economists here at Victoria University. I’m on a boring panel on climate change which will be a little less boring as I castigate economists for not communicating their discipline effectively, especially when it comes to the economics of climate change. Can post presentations from these events and will put up links when the conference material becomes public. Of course, I need to produce and bury a huge amount of compost to offset those flights (beyond the offsets I’ve already purchased), but that amount of travelling is not normal for me – I’m usually on a bike, not in a plane. Got a lung infection on the way back from the States that required a tonne of antibiotics – not blaiming my trashing of my immune system due to climbing big mountains, though. So that’s why no posts for a bit – better now: good to be back on the bike.